Jointly presented by the Law Society of Alberta and the Canadian Bar Association – Alberta, these prestigious awards shine a light on the outstanding contributions Alberta lawyers provide. 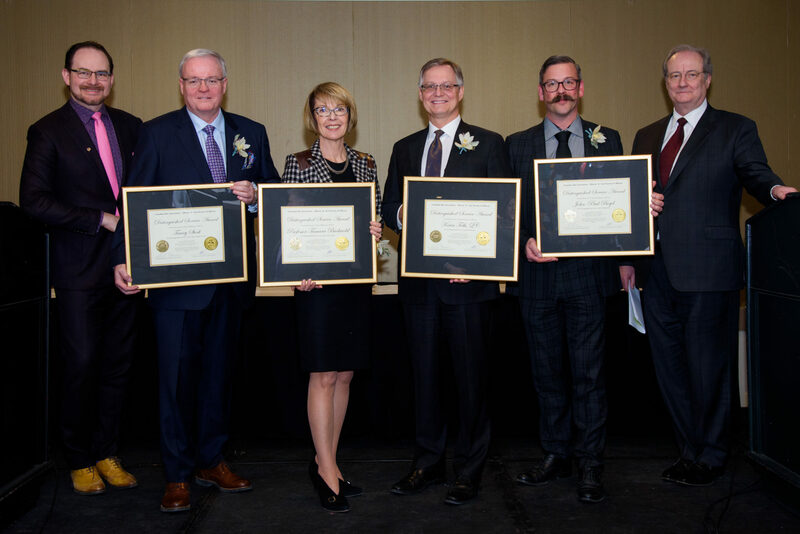 Four outstanding Alberta lawyers were recognized for excellence at the 2019 Distinguished Service Awards ceremony held on February 5, 2019 in Edmonton. See program. Pictured (left-right): Frank Friesacher – President, CBA-Alberta Branch, Tracey Stock, Professor Tamara Buckwold, Kevin Feth, QC, John-Paul Boyd, Don Cranston, QC – President, Law Society of Alberta.